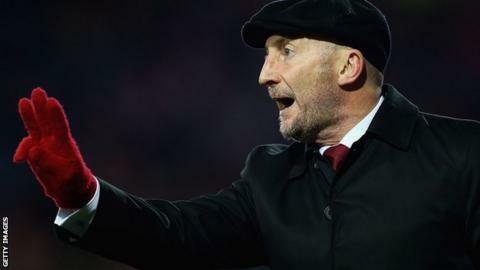 Ian Holloway: Crystal Palace boss questions Watford loan "loophole"
Crystal Palace manager Ian Holloway has described the rule that has allowed Watford to make 11 international loan signings as "ludicrous". The Hornets named seven loan players in their squad to face Palace on Friday, six of whom are from Watford's sister clubs Udinese and Granada. "They've got some world-class players that they've borrowed from almost one club," Holloway told BBC Sport. Under Football League rules, sides are only allowed to name five loan players in a matchday squad and can only take two players on a standard loan from any one club. But loan deals arranged with foreign teams are recognised as transfers, meaning there is no limit to the number of loanees from overseas. It also means that Gianfranco Zola's Watford were able to earlier in the season. Watford currently have 10 players from Udinese and Granada on their books - teams who are also under the umbrella of Hornets owners the Pozzo family - and six of these were named on the teamsheet for Friday's game. Nathaniel Chalobah, on loan from Chelsea, was the only Watford player in the squad who counted towards their loan quota. It is a system that has worked well for Zola, whose side are third in the Championship. Holloway, who saw one of his own loan players, Kevin Phillips, net the equaliser at Vicarage Road, added: "We're only allowed to borrow two from the same team in this country. Unlimited abroad? That gives a licence to people to buy English clubs, chuck all their players over here and have a reserve team. "What if Barcelona wanted to buy us and play their 'B' team for us? We've got to sort this out. "No arguing - what their manager is doing and how they're doing it is fantastic. If there's a loophole, they've found it and some of those players are as good as any I've seen in the world. "But I can't believe there's such a massive loophole, and my question is - where are those English players going to come from?" Despite a reliance on foreign imports, Watford have maintained their tradition of using young, homegrown players. Eight players produced from the Watford academy have played a competitive match for the Hornets this season.